Man’s fundamental nature is to unfold, to evolve. Fear curtails this activity and you become unhappy. If you are fearless, your potentials will unfold. Without a regular habit of sadhana to build the strength of the crystal aura, you are at the mercy of fears. If the magnetic shield is strong, negative thoughts turn to positive energy as they pass through the auric shield. This meditation calls on the cosmos or God through the sound of compassion and stimulates the inner sounds. The universe becomes the mother and you the child. Call and she shall come to your aid. Sit with the right knee up and the left leg flat on the ground. The sole of the left foot faces the right foot and contacts it so that the ball of the left foot is just in front of the anklebone of the right foot. 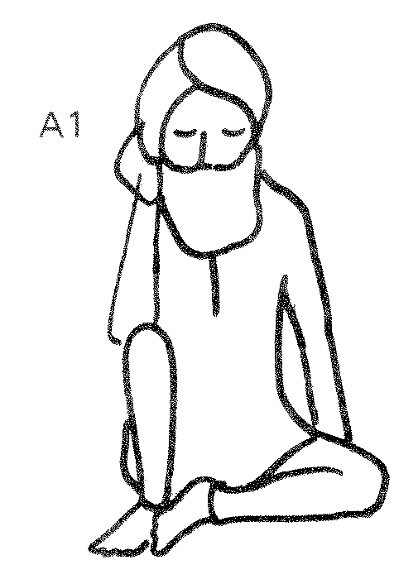 (A 1) Lean back on the left arm making a fist of the hand and rest the right elbow on the right knee. 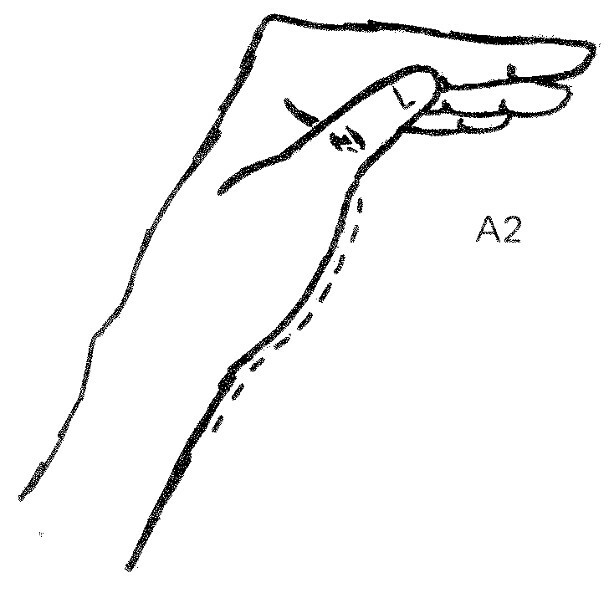 The palm of the right hand rests so that the base of the thumb is on the cheek bone and the rest of the hand forms a cup over the ear with the top open. (A 2) Inhale deep and begin chanting a long, smooth Maaaaaaaaaaaaaaa. Listen to this sound through the cupped palm. Continue for 31 minutes and then change sides for an equal time. It’s best to start slow, with a total time of 31 minutes for both sides.